The Captain Whittaker is a 65 foot, Open to the Public, Charter Fishing Boat sailing out of Captree State Park for over 40 years. We are Captree’s ONLY BAY FISHING Vessel. We Fish for Fluke and then Striped Bass in the Fall and can accommodate up to 60 Passengers. 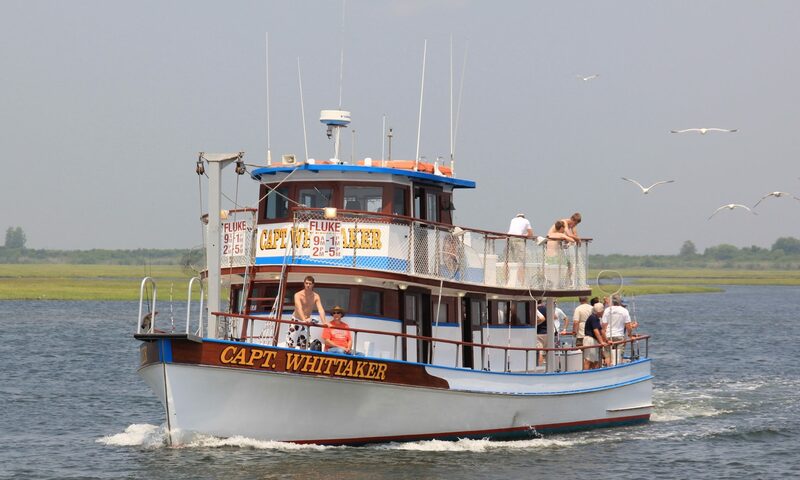 The Captain Whittaker Cruises and Fishes in the Great South Bay and Captree Inlet. We Do Not Go Fishing in the Atlantic Ocean, Where the Seas are Rougher. We Sail in the Calmer Water of the Bay and Inlet Only. Come Fish the calmer water of the Fire Island Inlet and Smile! The Captree Inlet is a Wonderful Place to Fish. Very Much Alive and Amazing Surroundings. The Ocean and Bay Waters Stream with the Tides and Attract all types of Marine Life and a Whole lot of Fish! The Captain Whittaker features Individual Clean, Updated Restrooms for both Men and Woman. Super Clean bathrooms for men and woman. The Captain Whittaker features a Newly Renovated Heated Main Cabin along with Great 2nd Deck Seating in the Sun and Breeze. The Captain Whittaker features a Coffee and Snack Bar with a variety of Chips and Candy along with Coffee, Water and Soft Drinks. Come on Down for a Day of Fun on the Beautiful South Shore Captree Bay Waters. Call 516-587-7087, talk to Captain Rick today and Secure Your Date with Some Fun.